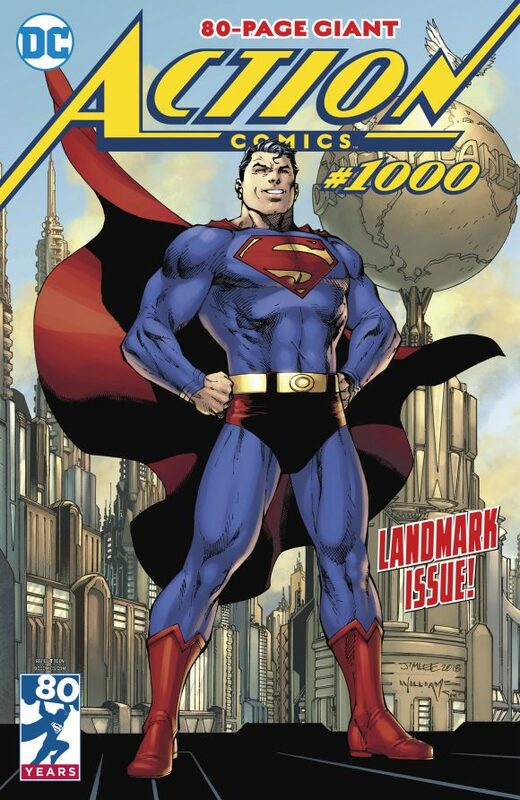 Action Comics #1000, which is out now, is about Superman’s past and present, but also very much his future. There’s a series of lovely and entertaining stories by top-notch Supertalent like Richard Donner, Geoff Johns, Dan Jurgens, Louise Simonson, Jerry Ordway, Paul Levitz, Neal Adams and many others — even Curt Swan. But the story that’s got most readers curious, I’m sure, is the last one in the pack — The Truth, written by Brian Michael Bendis, whose DC arrival is the biggest coup since John Byrne similarly defected from Marvel 30 years ago. Well, it certainly delivers promise, that’s for sure. 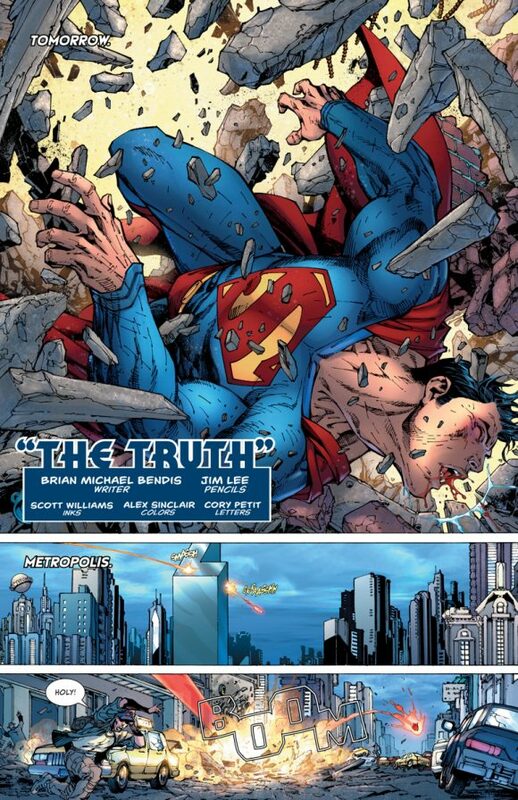 The 12-pager, illustrated by DC co-publisher Jim Lee, with inks by Scott Williams and colors by Alex Sinclair, plops us down into the middle of a big smash-’em-up in Metropolis between Superman and a new villain called Rogol Zaar. 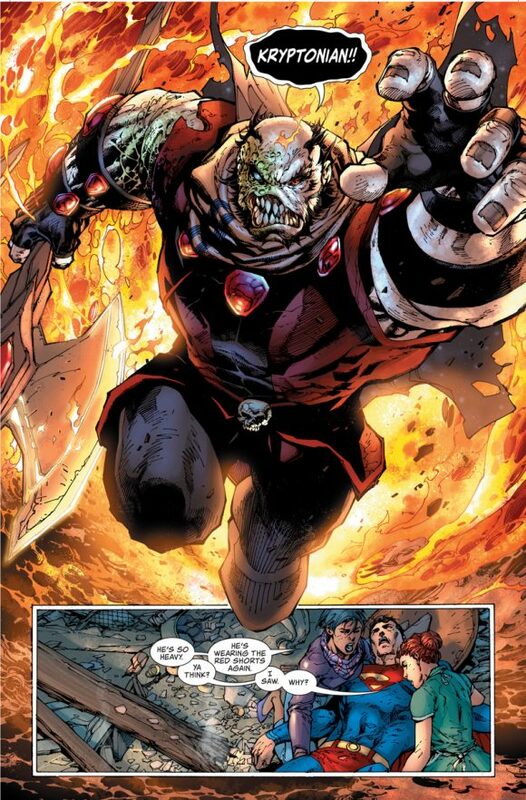 Rogol Zaar’s pretty much your run-of-the-mill, hulking alien with a battle-ax — except he claims to have not only known Superman’s father, Jor-El, but to have destroyed the planet Krypton. Bendis even tucks in some characterization, showing Superman trying to simultaneously protect the people around him while withstanding Rogol Zaar’s onslaught; in one tense sequence, our hero slows his forward motion to keep from smashing into a store full of shoppers. It’s crackling, zippy stuff, with all 12 storytelling pages used to their fullest. Of course, it’s impossible to draw any firm conclusions about any of this — and we’re going to get another taste in two weeks with the DC Nation #0 sampler, which will feature a Man of Steel prelude by Bendis and Jose Luis Garcia-Lopez. Then comes the weekly Man of Steel miniseries itself, launching at the end of May — and then Action Comics #1001 and Superman #1 in July. So this is just the beginning of the beginning of the beginning. But what a fun beginning it is.